The Ski Foundation Level 1 (SF1) is a 5-day introduction to alpine skiing. The content includes clothing and equipment, winter hazards, ski safety and the FIS code, Central Theme: introductory activities, sliding, snowplough, snowplough turning, plough-paralleling and piste navigation. This is linked to the fundamentals of control of speed & line, adjustments for snow & terrain, steering; edge, pressure & rotation control, body management; posture, balance, movements & co-ordination, flow; smooth linked movements. 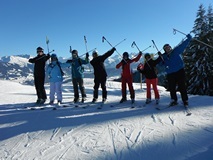 The outcome for the course is for the candidate to demonstrate a competent level of alpine skiing skills as a member of a led group on alpine green/blue graded slopes within a marked pisted ski area. The Intermediate Ski Course (ISC) is a 5-day continuation training and further development beyond the SF1 award. This course links the fundamentals of control of speed & line, adjustments for snow & terrain, steering; edge, pressure & rotation control, body management; posture, balance, movements & co-ordination, flow; smooth linked movements beyond Central Theme: steeps, bumps and variable conditions. The outcome for the course is for the candidate to demonstrate a competent level of alpine skiing skills as a member of a led group on alpine red graded slopes with mixed terrain variables. The Ski Foundation Level 2 (SF2) is a 5-day course. This course is an introduction to alpine ski touring (a minimum of 40% of course time will be spent in off-piste terrain). The content will include ski touring clothing and equipment, winter hazards, planning and participating in a tour, avalanche awareness and avoidance, movement of skis in ascent and descent, navigation on skis, route choice and finding. The outcome of the SF2 is for the candidate to demonstrate a basic level of skill in alpine ski touring skills to be a competent member of a led group on basic ski touring expeditions. The Ski Foundation Level 3 (SF3) is a 5-day continuation training and further development beyond the SF2 award (a minimum of 80% of course time will be spent in off-piste terrain). The content will include ski touring clothing and equipment, winter hazards, planning and participating in a tour, avalanche awareness and avoidance, movement of skis in ascent and descent, navigation on skis, route choice and an introduction to moderately steep slopes and strategies to cope. The course will also include an overnight expedition using an alpine mountain hut The outcome of the SF3 is for the candidate to demonstrate a competent level of skill in alpine ski touring skills to be an effective member of a led group on extended ski touring expeditions.